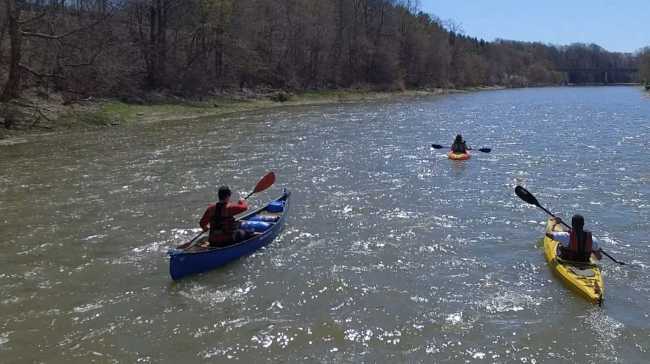 The Thames River has nearly 400 km of waterways navigable by canoe or kayak and the Kilworth to Delaware leg of the main branch of this river is a great route for novice to intermediate paddlers. Before you grab your gear, be sure to read up on the full description of all that you&apos;ll experience on the Thames by clicking here. Park and “put in” just east of the town of Kilworth at a small gravel parking lot on Old River Road, which is located just off of Oxford Street West. This 12 km paddling route starts out with a section of rapids (class 1 or 2) right under the Oxford Street bridge and several short sections of Swifts and Class 1 rapids separated by deeper pools which continues all the way to the town of Delaware. Immediately after the Oxford Street bridge, paddlers enter the 198 hectacre Komoka Provincial Park and its spectacular cliffs and mature forest. This unique geography was formed some 12,000 years ago, after Lake London, formed by retreating glaciers after the last ice age, breached at this location. Water flowing out of former Lake London then created one of the first river systems in Southern Ontario. Geography of this route is also unique because of the high concentration of islands, which includes the largest island in the entire Thames River watershed, located directly upriver of the Komoka Road bridge. These islands provide a great opportunity for paddlers to have their own isolated place to stop for snacks or lunch and explore the thriving habitats. Autumn is a fantastic time to paddle this route as cooler days and nights usher in the spectacular hardwood tree colour change of Autumn. The peak of the colour change can be observed anytime from late September to late October. This section of the Thames Main Branch is directly down river of convergence of the North and South Branches, formally known as The Forks of the Thames. In this section, you will experience an elevation drop similar to the North and South Branches, so expect to experience many swifts (bursts of speed) and, depending on water flow rates, several rapids (class 1 and 2). Because of this elevation drop, extreme low flow rates could cause low water conditions and paddlers may experience slow forward progress or even cause paddlers to get out and walk over sections of shallow water. Because this section of river is fed by both the North and South branches, as well as several dozen creeks, high flow rates can be a concern after spring snow melt and after rain fall events. Please reference the recommended flow rate and check the live flow rate gauge at Byron, made available by the UTRCA, prior to any trip. Delaware Conservation Area Day-use Parking Lot, located in the town of Delaware, is a free use parking lot. Finding the finish location’s “takeout” from the river can be difficult due to several small islands, but if you miss the takeout, you come across Longwoods Road (Highway 2) bridge shortly after. A simple check of the takeout location before the trip will assist paddlers in finding the takeout from the river at the end of the trip. There is one other bridge location found along the way at Komoka Road (GPS:42°56&apos;01.5"N 81°25&apos;16.0"W) near Delaware Speedway. This bridge can be utilized in the event you need to make a shorter paddle of this route. 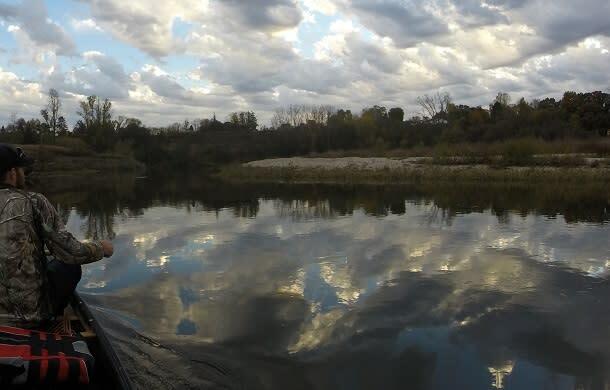 This route is located close to Highway 402, and just west of the city of London which makes accessing it very easy for out of town paddlers as well as area residents. Head out and start paddling. Be sure to check the Fanshawe Dam to North London and Ingersoll to Dorchester routes along the Thames too.